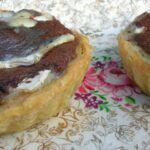 There’s no getting away from it, the best word to describe these chocolate goat’s cheese tarts is unctuous. 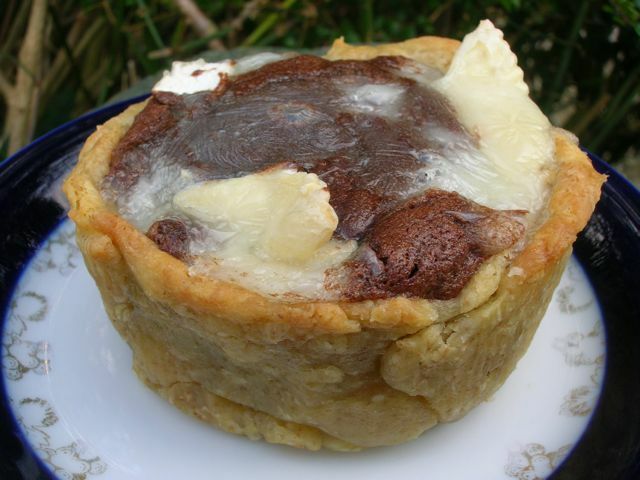 Think molten dark chocolate mousse oozing with salty goat’s cheese in a wonderful flaky pastry case. If you like the combination of salt and sweet, you’re almost bound to like these. Dom is up to his old tricks again. He’s randomised Random Recipes even more than usual by getting us to use a highly technical random thingamidoodah to pick our books for us this month. Luckily I didn’t have to count all of my books as they are scattered around the house. Instead, I used the oh so wonderful Eat Your Books which has all of my cookery books logged. The current count is 88. So, in went number 88 to the thingamidoodah and out came number 31. Arranging them alphabetically by author gave me Jane Grigson’s Vegetable Book. Now wonderful as this book is, it didn’t seem likely I’d be lucky enough to find a recipe I could easily adapt to include chocolate. So I had another go and rearranged the books alphabetically by title. This time it was much more successful. Number 31 gave me The Chocolate Lovers by local boys the Tanner Brothers. I no longer needed to worry about adapting recipes to include chocolate. So the next stage was over to CT to pick a number, which he did. Number 49 got me Chocolate and Devon blue cheese tarts. Hooray – absolutely perfect! Normally, I’d have used some Cornish Blue instead of the Devon, but I just so happened to have some of Ethel’s wonderful Capricorn goat’s cheese which I’ve been wanting to try with dark chocolate for some time. 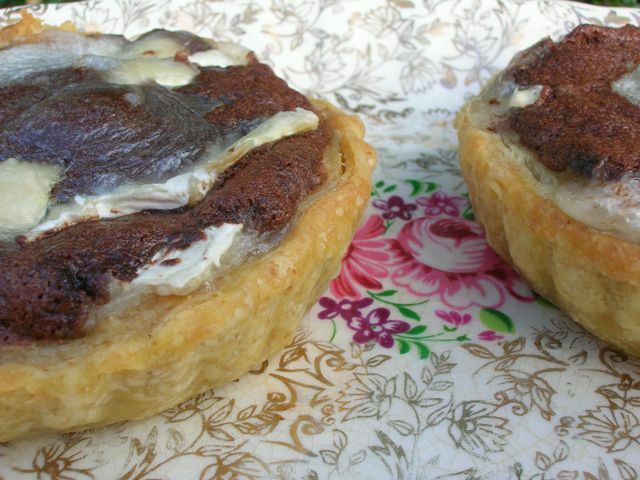 Thus it was that the Tanner Brothers’ creation morphed into these chocolate goat’s cheese tarts. I had to adapt the recipe some more as I halved the quantity of their filling and it didn’t fit neatly into halves. I sort of thought I was going to like these chocolate goat’s cheese tarts and I was right. They were delicious warm not long out of the oven, but equally scrumptious cold. They had a mousse like texture and the salty cheese was a perfect foil for the dark chocolate. If you like salted chocolate like I do, these are well worth getting acquainted with and even if you don’t, you may find you like them anyway. CT tells me I’m sweet enough without (I wish), but I really liked the barely sweet nature of these chocolate goat’s cheese tarts. I don’t know if it was the inclusion of icing sugar or my careful handling of the dough, but this was the best pastry I’ve ever made. It was so flaky, CT thought it was meant to be flaky pastry. For other recipes with cheese and chocolate combinations, I’ve written a goat’s cheese and chocolate post you might find interesting. Alternatively, head over to my chocolate and cheese Pinterest board. Chocolate Goat’s Cheese Tart. PIN IT. 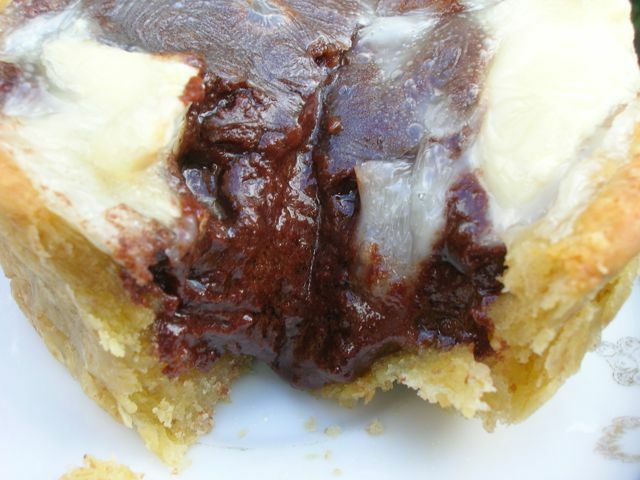 Molten dark chocolate mousse oozing with salty goat's cheese in a wonderful flaky pastry case makes these tarts a sophisticated but most delicious dessert. Sift the dry ingredients into a bowl. Rub the buttering the flour with your fingers until the mixture resembles breadcrumbs. Make a well in the centre, add the egg and enough water to form a soft but not wet dough (about 50 ml). Stir in with a round-bladed knife, then bring it together with your hands to form a ball of dough. Flatten to form a disc then place in a plastic bag and leave in the fridge for an hour to rest. Set the oven to 180℃. Roll the dough out as thinly as possible and line six 10 cm tart cases. Place back in the fridge whilst the oven warms up. Place the tarts on the top shelf and bake for about 12 minutes until golden. Meanwhile, melt the butter and chocolate in a pan over a very low heat. Leave to cool a little. Whisk the egg with the sugar until pale and thick. Pour the chocolate mixture down the side of the bowl and fold into the egg as gently as possible. Divide the mixture between the tart cases, then scatter the cheese over the tops. Bake at 180℃ for a further 8 minutes. Leave to cool or eat warm. You'll have enough pastry left over to use for something else. It will keep in the fridge for a few days. The wonderful Random Recipes monthly challenge is hosted by the Dashing Dom over at Belleau Kitchen. It gets us all to use books and recipes which might otherwise sit gathering dust on the shelves. I love cheese and the combo with chocolate souds delicious. I love Ethel’s goat cheese too (I prefer the milder flavour it is so versatile for cooking into sweet and savoury dishes) and what a combination! wonderful idea. I absolutely LOVE the look of those tarts, though I cannot for the life of me imagine what they taste like. Mind you, I can’t imagine what chocolate and blue cheese would be like either, except perhaps a migraine waiting to happen! You always seem to come up with such Random Recipe winners, I am very envious. Perhaps some of my cookbooks are just too random! They look wonderful – fascinated by Eat Your Books though! Mmm… this is a real speciality Choclette. I really fancy trying it. Goat cheese and chocolate a match made in heaven! That oozing chocolate shot has done it for me, I am now absolutely starving! They look beautiful! Oh my what a great combo of my two most favorite non-fruit foods! Such an interesting filling! Yes … salt and chocolate is good together! Goat cheese and chocolate though? Wow! Such a leap! I’m impressed! This is one of those recipes that sounds strange but you feel compelled to try. Ethel’s cheese might just find its way into my shopping trolley this week. They look great. I do know these flavours work well together as I tried them out at Rococo in their goat’s cheese ganache. It was something else! I just love it and there is nothing better than a good flaky melting pastry, one of my favourite cooking activities s making pastry. It is my downfall! 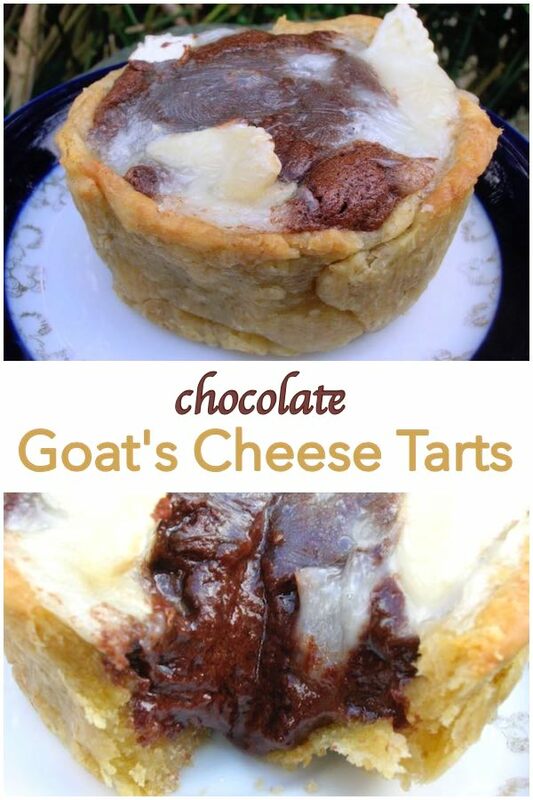 I think this is one I would have to try, not sure about goat’s cheese with choc, lol. They do look beautiful I must say. Hm … what did Dom say about cheating?! Well, no worries, those tarts are so luvly, I would appreciate one, too. It’s that cheese thing again. Turned out super delicious! The crust is very popular with my coworkers! Such a wonderful way to pair two of my most favorite flavors–chocolate and goat cheese! Glad they turned out well and thanks for making them. I loved that pastry too.